Google today launched the website for its Google I/O 2014 developer conference over at google.com/io. The company also revealed that registration will be open between April 8 at 5:00am PDT and April 10 at 5:00pm PDT. 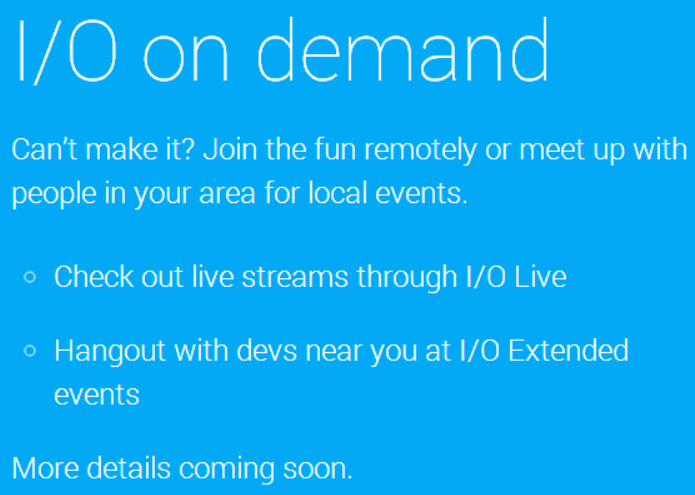 If you can’t attend, Google will also have a livestream of the keynote and sessions as well as local I/O Extended events. As Google revealed last month, Google I/O 2014 will be held on June 25 and June 26 at Moscone West in San Francisco. This year, to stop the event selling out too quickly, the company will be randomly selecting from the list of applicants after the registrion window closes on April 10.